Students and staff from City, University of London have taken part in the annual Lord Mayor’s Show parade to welcome Alderman Dr Andrew Parmley to the post. In becoming the Lord Mayor, Alderman Dr Parmley will also become the Rector of City, University of London, symbolising the link between the institution and the City. City’s float in the procession aimed to celebrate its founders, graduates and future students. It included a vintage routemaster bus carrying students and staff in academic dress along with pupils from the City of London Academy Islington, a local academy supported by City. They were also accompanied by representatives from the Worshipful Company of Saddlers, an organisation who helped to found the Northampton Institute in 1894. The Lord Mayor’s Show is one of the most famous annual events in London. The centuries-old tradition dates back to 1215 and is held to celebrate the newly elected Lord Mayor. More than 7,000 people and 200 horses took part in the parade and City’s float was one of 140 that travelled the two-mile route. The procession included livery companies, schools, charities and organisations that the Lord Mayor chooses to support during this tenure. 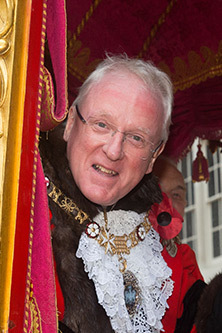 The new Lord Mayor, Alderman Dr Andrew Parmley, is the principal of the prestigious Haroddian School in London. He has extensive experience in education having served as Chairman of several schools and is the City Champion for the Prime Minister’s Apprenticeship Board. Aside from education, the Lord Mayor also has interests in music. He is the International Ambassador for the London Symphony Orchestra and a Visiting Professor of the Guildhall School of Music and Drama. He is also the patron of a number of choirs and instrumental ensembles. The Lord Mayor’s Show was broadcast live on BBC One and is available to view on iPlayer.